The "Royal River" (Breton Liger) travels a distance of 1,000 kilometers from the Massif Central Massif in southern central France to the mouth of the Atlantic Ocean. He gave this huge wine-growing region with about 70,000 hectares of vineyards the name. Like everyone waters he exerts a positive effect on viticulture or creates for the condition by the formation of valley slopes. The Loire rises south of Lyon, flows first in a curve to the north and then turns to Orléans to the west. It crosses twelve départements and receives a total of ten tributaries. 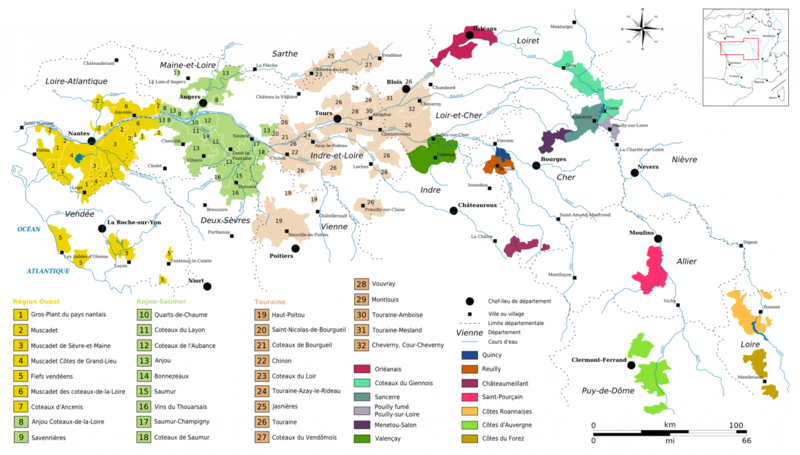 A significant winegrowing is on both banks of the Loire on a distance of about 400 kilometers, the vineyards are divided into many areas. The Romans were already planting vines here at the turn of the century. Already in the 11th century, the wines of the Loire in England and Holland were popular and were imported in large quantities. In the 12th century, the Cistercian at Savennières a vineyard, the famous location Coulée-de-Serrant, On the banks of the Loire, the French kings and many aristocrats built splendid hunting lodges and castles; There are more than 400 castles along the Loire and its tributaries. The most beautiful are from the Renaissance under King Francis I (1494-1547). This brought Leonardo da Vinci (1452-1519) to his court, who lived until his death in the Château Clos Lucé (near Château Amboise). The canonized Jeanne d`Arc (1412-1431) arrived Chinon The first time with King Charles VII (1403-1461) together to motivate him to fight against England. UNESCO declared the "Val de Loire" (Loire Valley) in the year 2000 World Heritage appointed. Due to its size, the region has climatic conditions from continental in the Massif Central to Atlantic at the Loire estuary by the sea. In combination with the different soil conditions also different wine types result. And yet these have a commonality of fresh acidity, fruitiness and tenderness of aromas, which is due to the northern location of most appellations. The region is above all a white wine region. The two main varieties Sauvignon Blanc and Chenin Blanc (referred to here as Pineau de la Loire) provide dry to noble sweet aged wines. Above all, the sparkling wines are famous, the area Saumur developed after the Champagne to the second sparkling wine center of France. The most important red grape varieties are Cabernet Franc (Breton), Gamay, Malbec (Cot) and Grolleau. This will be rosé wines, Vins gris and obtained fruity red wines, which are largely intended for quick enjoyment. This page was last modified at 2 May 2018 at 19:04.